THIMBY team at Tiny House Competition, October 2016. For years now, the Tiny House movement has been a Big Deal. It’s captured the imaginations of residential homeowners, city planners, international development agencies, homeless and affordable housing advocates, and the renewable energy/sustainable living community. It sparked the interest of a group of Energy and Resources Group (ERG) students back in 2014 when the Sacramento Municipal Utility District (SMUD) announced the first-ever Tiny House Competition, soliciting applications from colleges and universities in California to design and build off-grid tiny houses for any specified end-use. 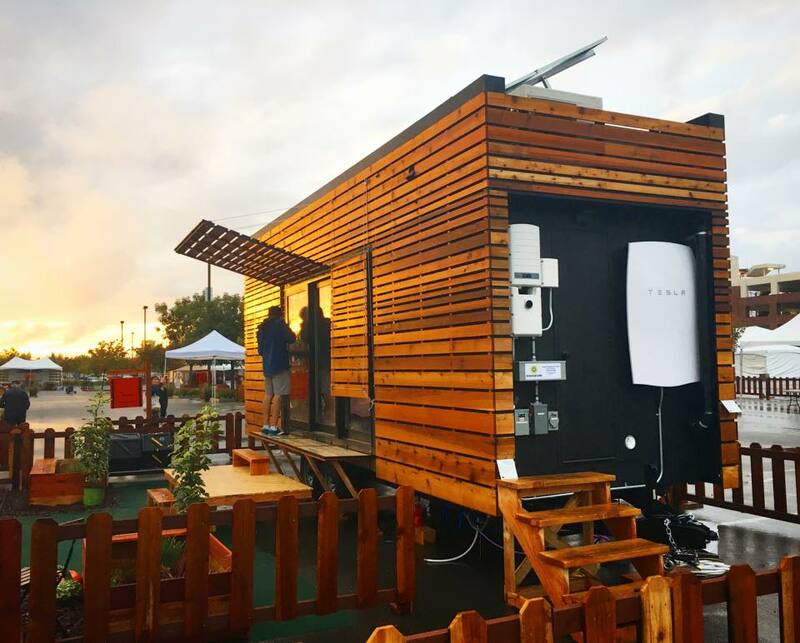 This group, THIMBY 1, worked for two years to fundraise, research, design, and construct the first UC Berkeley tiny house, which won top awards at the SMUD competition for Water Conservation, Sustainability, Craftsmanship, and Home Life. Other teams in the competition included Laney College (which has a well-respected carpentry training program), Santa Clara University, and several Cal State campuses. In the intervening years, the Laney College team has gone on to build several additional tiny houses to address the affordable housing crisis for the City of Oakland. A Berkeley project in the works from Youth Spirit Artworks (YSA) proposes to build a Tiny House Village for homeless youth, with onsite resident advisors, social workers and jobs training, but is seeking Berkeley city government support with siting and permitting. The initial budget proposal to Berkeley City Council attaches an article published in the Richmond Confidential about THIMBY during the project planning phases, addressing the issue of tiny house legality and homeless housing. It remains unclear if such villages can take advantage of emergency housing policies, or if the residential period of intended users qualifies them for “traditional” residential permits and zoning. Despite lack of legal clarity, tiny houses for homeless and affordable housing are gaining momentum as a promising strategy favored by alliances of city governments, non-profits, and city planning researchers forming to address the housing crisis pummeling regions such as the San Francisco Bay Area. The ease and speed of assembly (especially when modular) combined with low cost and community-building benefits of tiny house villages make them an attractive alternative to larger apartment or condo complexes. Onsite energy generation and composting toilets, where permissible, further decrease the strain on existing city infrastructure. The design of THIMBY 1, built around the SMUD Tiny House Competition requirements, does not make this particular unit well suited for homeless housing. The combination of new energy technologies and off-grid water systems have required a fair bit of experimentation, energy expertise, and physical labor from the residents above and beyond what average housing residents would consider desirable. The cost of the energy systems alone would make this too expensive to build for scalable homeless housing. The tiny, sustainable, affordable housing challenge is something that the THIMBY 2 project will take on as part of its mission, as I discuss below. I’ve had the good fortune of living in THIMBY 1 for the past several months. It’s been a series of up-and-down hurdles and learning experiences— perhaps ideal for a graduate student researcher passionate about experimenting with sustainable-living behavior changes, but a few kinks remain to be worked out in order to garner widespread appeal. The maintenance alone is significant even in such a small living space. This owes in part to the suite of innovative technologies integrated in the house, for which there is not yet a well-developed pipeline of customer support. The hours we’ve spent on the phone with SolarEdge and Tesla trying to get the inverter and battery to communicate to each other and function in both off-grid and on-grid settings, or tinkering with the Sanden CO2 heat pump to prevent it from thermo-siphoning could constitute several Master’s-level theses. Our team continues to expand and evolve around tiny-house-related research. We’re developing a prototype of a Home Energy Management Systems (HEMS) that will optimize solar generation, battery state of charge (SOC), and certain controllable loads to keep the house comfortable while using energy at optimal times (determined from weather forecasts and battery SOC). This new offshoot project, EMPOWER (Energy Management Producing Opportunities for Widespread Emissions Reduction), aims to launch a commercial product that will integrate with solar home systems and provide grid services by taking advantage of dynamic pricing and times of peak solar generation to use that energy directly for flexible loads within the home. The product is intended to save money for both electricity customers and utilities, and be affordable to low-income households. The THIMBY 1 pilot has generated a valuable set of lessons learned and experience with new technologies that will be useful in future implementations, whether on- or off-grid. Meanwhile, a whole new team of graduate and undergraduate students is forging ahead on the second iteration of the THIMBY project. From initial meetings and email blasts to departments soliciting student interest, almost 100 students replied, enough to form several side-by-side teams of student tiny house designers. THIMBY 2 is partnered with the City of Richmond and Richmond BUILD to design and construct tiny houses to serve transitional homeless housing needs. Richmond BUILD is a construction training organization that works with minority populations and formerly incarcerated individuals to provide job training and placement in carpentry and contracting positions. They will provide the building space and expertise for UC Berkeley students working alongside trainees on the design and construction elements. The Richmond Housing and Community Development department will provide connection to transitional housing groups that will also contribute to the design specifications, ultimate siting location and selection of residents for the future tiny house(s). Partnerships like this are extremely promising examples of universities, city governments, and social organizations coming together to tackle pressing economic, social, and environmental challenges. Solving affordable housing dilemmas in a way that reduces residential energy footprints, advances the building energy transition needed to reverse climate change, and provides social and economic services to residents achieves a triple bottom line of social, economic and environmental benefit. While every location-specific context requires different considerations in terms of affordability and sustainability of tiny house construction, the sky’s the limit to the number of viable applications for tiny housing. From addressing homeless housing in Richmond to building for international contexts in Nairobi, students from the UC Berkeley/RAEL THIMBY team are thinking big about tiny living. THIMBY house at SMUD Competition. If you are interested in getting involved with the THIMBY 2 or future THIMBY projects, contact Shane Wright (shanebwright@berkeley.edu) and Laney Siegner (asiegner@berkeley.edu). May is International School Grounds Month, and organizations like Green Schoolyards America are inspiring and enabling communities to enrich their school grounds and use them to improve children’s well-being, learning, and play, while contributing to the ecological health and resilience of their cities. ERG student Alana Siegner contributed to this year’s Living School Yard Activity Guide, designed to provide a wide range of outdoor activity ideas for elementary, middle, and high school students. Her activity allows students to gain hands on experience with composting, and learn about climate change. Well, it’s winter in California again, and you know what that means- watching the snow forecast in the Sierras, complaining about the 50-degree highs, and, of course, succumbing to power outages regularly in the tiny house (yikes! ).